I watched the movie this morning and was very moved. This type of dissent is needed in Western culture. So much is taken for granted in Western culture,yet there are many actions taken my Western governments that is seemingly,silently accepted and IF not approved of;few are willing to take the time necessary to change certain actions that are completely unacceptable. The NSA listening to phone calls based on national security may,at times,be necessary BUT what amazes me is how little is truly questioned when this info is made public. One wonders if people would take the time to demand explanations that the American people are entitled to……yet few take the time or show enough interest!!! Amazing………. WE have been brainwashed to expect this kind of behavior in other cultures. 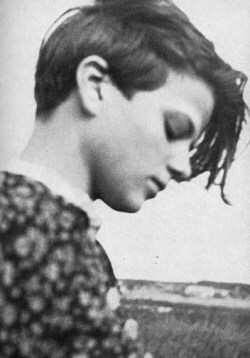 Sophie Scholl is a great inspiration to me. I HAVE a picture of her on my mirrior and almost daily she leads me into my own rightousness. I am stronger in the knowledge of her existance of conviction and sacrifice. I learned of The White Rose Campaign in a very mystical way. I am a ceramic artist/potter and now incoperate the “white rose” in many of my pieces. They represent the strength, beauty and peace so needed in that era and in deed today as well. Long live Sophie and her brother – they were heros.